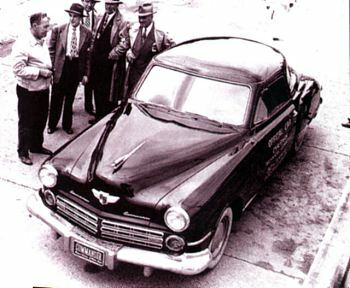 Only 16,385 of the '46 Studebakers were made before the all-new 1947s were introduced in June 1946. There were no 1946 Commanders or Presidents or Land Cruisers. Commander zostanie wprowadzony w przyszłym roku. THAT Studebaker Coupé Express Pick-up you see in the picture above is a full-fledged teammate of 197,661 Studebaker military trucks that wrote brilliant new pages of transport history at the fighting fronts. It's smaller in size and in load capacity, of course. But it has the same kind of stand-up stamina as Studebaker's big, powerful army trucks. This means it makes few trips to the repair shop throughout its long life, thanks to a combination of top quality materials and painstaking craftsmanship. Makes upkeep hit the downgrade! Informed truck operators, who use hard, cold facts as their buying gauge, know there's nothing to match the gas-saving and tire-saving reCord of Studebaker trucks. 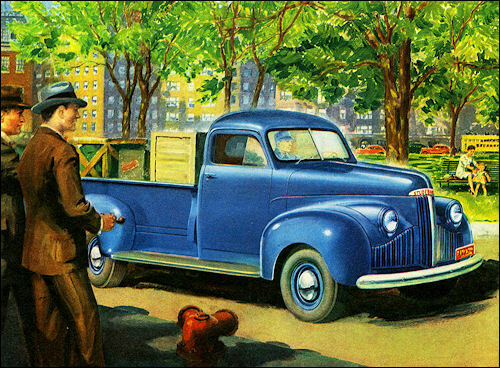 Studebaker's truck engineers in their great scientific laboratories and on Studebaker's unique, 800acre, million-dollar proving ground. It isn't possible just yet to meet all demands for this good-looking, restful-riding half-ton Coupé Express. 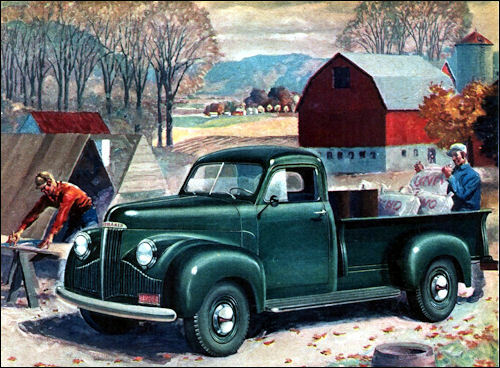 But Studebaker's truck manufacturing facilities have been greatly expanded. And the time is coming when a full supply of Studebaker half-ton, one-ton and still larger models will be available. Don't settle for anything less than Studebaker quality and economy in your next truck. Make arrangements now with a nearby Studebaker dealer to give your new truck needs his special attention.